I am the mother who will pull over to the side of the road in the rain, dig through all her craft show gear in search of some sort of camera (ultimately finding it in the very. last. box.) 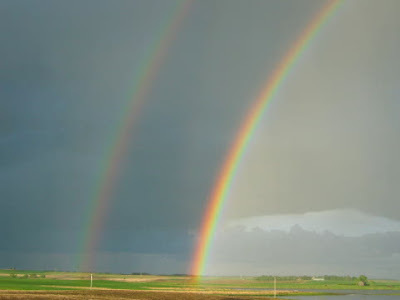 just to take a picture of the double rainbow her son spotted. Yup. That's the kind of mom I want my son to remember me being. 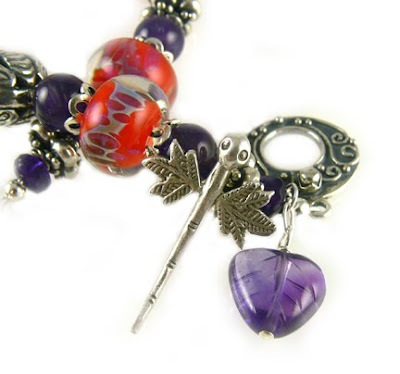 I have a blog article on Watch Me Create about using non-traditional jewelry components in jewelry. 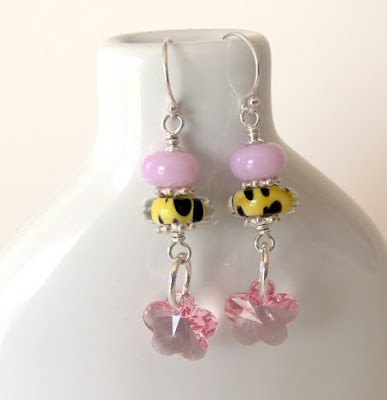 I've been trying to use only what I have in my stash, rather than buying new beads all the time, and you can see some of the results by clicking here. I have a show this weekend, my first in a long time, and a new venue for me. If you're in the Annapolis, MD area, come and see me at the Quiet Waters Park show. Click here for more show information! Can't make it to the show? 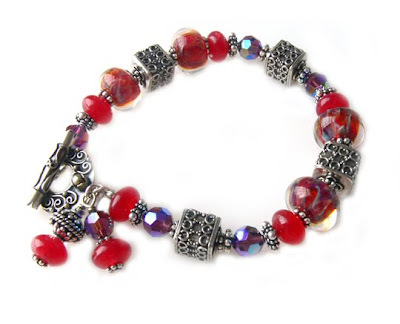 You can shop day or night at www.lorianderson.net! I just got through watching the premiere of "House" that I TiVo'd, and it made me happy on so many levels. First, of course, it has Hugh Laurie in it, and Hugh Laurie is, in my opinion, very easy on the eyes. 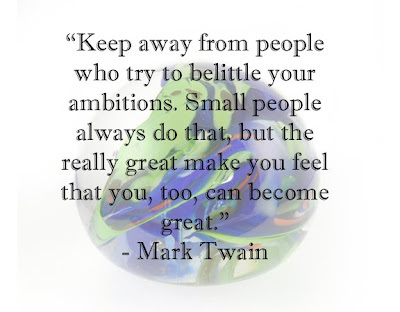 I also for some reason really like that cranky curmudgeonly attitude and amazing brilliantness. (Pause in your reading to sigh longingly with me). This episode reminded me of "One Flew Over the Cuckoo's Nest" sans lobotomy and with a much happier ending. I didn't have to cry because no one died (which is the main reason why I had to quit watching "ER"), and my heart just flew out to every single one of the patients and doctors. All in all, one of those feel-good shows, for once. When Lori Anderson isn't catching a bit of TV, she's designing jewelry. You can see her work at www.lorianderson.net. I have been a fan of Step by Step Wire magazine since it's beginning. I love using wire in my jewelry, and plan to use a lot more of it in my designs next year (all part of my plan since I'm going to be doing a lot fewer craft shows). Right now, my wire work has been limited to doing fun things for earrings and maybe for a few bracelet components, leaving the few really intricate pieces I find time for to be sold at a gallery I work with. 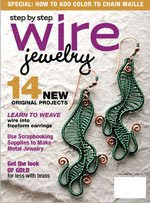 I was tickled that the fall edition of Step by Step Wire included my tutorial for these earrings I named "Tribal Curves". They started, oddly enough, when I goofed up making a pair of ear wires. I accidentally made the bottom loop too large and had to make it look right, and decided to wrap some hair-thin wire around it. Voila -- "Tribal Curves" was born. 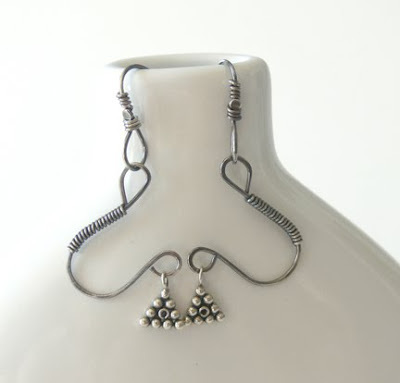 The earrings are currently for sale at my web site, www.lorianderson.net, and you can buy them by clicking here. 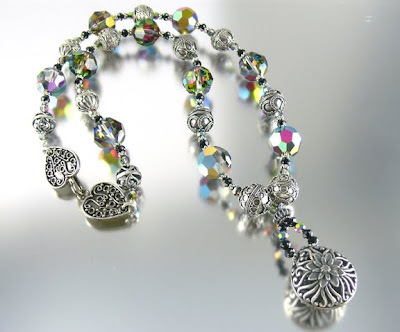 I was recently asked by ArtBeads.com to choose some items from their inventory of over 5,000 Swarovski components and review them. What a delight to browse through and fill up a basket with sparkly goodies! I'm one of those jewelry designers who sees a bead and immediately knows what I'm going to do with it, so as soon as the package arrived in the mail, I set to work. Next, I chose some bright red cubes. A couple of years ago, I made a line of jewelry that used 6mm cubes and crystal squaredelles and they sold like mad, but I'd never made them in larger sizes. These larger cubes definitely made a difference in impact, and I think I'm going to have to play around some more with them. 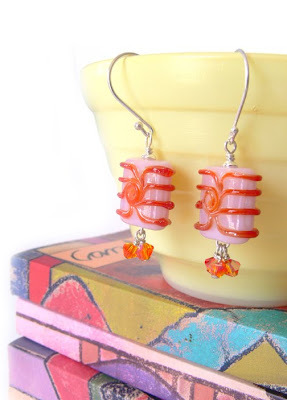 I then chose some little flower pendants in light rose, and paired them with handmade lampwork glass for an unexpected kick. These next earrings incorporate a bead I've wanted to try out for a while, the new Graphic Cube. I absolutely love it and can't wait to order more in every color. It reminds me of the 5309/1 Round Bicone, but with more squatness. The hole is larger than the normal Swarovski crystal bead, so for wire wraps, I recommend using a 2mm or 3mm bead to stop the hole and not have your wrap drop into the hole. The faceting is awesome, and the 8mm size I used gives you the best opportunity to really see the uniqueness. 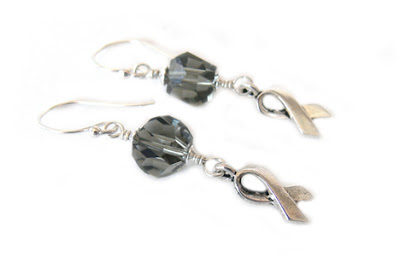 The earrings are for Diabetes Awareness -- gray is the awareness color. I love snowflakes, so it was a cinch that I would choose a snowflake pendant. I made a necklace with this one, creating a waterfall cluster of dyed cultured pearls in blue and 6mm clear AB Swarovski crystals. The snowflake is also Crystal AB for optimum glitter and shine. 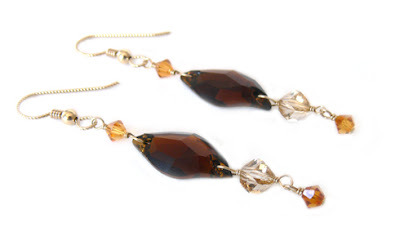 The next two pairs of earrings are my favorites, and also took the longest and were the most difficult to make. The first pair incorporated two 24mm pendant drops in Bermuda Blue, one of my favorite coatings. (I'm a big fan of Swarovski's custom coatings and try to collect every cut and color that I can.) I then wired tons of 4mm bicones to the top of the earring, using fine-nose pliers to make the tiniest loops possible and to get as many crystals in there as possible. I'm pretty pleased with the result, but don't want to make too many of these at one sitting! Lastly, I wanted to take something that wasn't meant to be used for beading and turn it into a beading component. 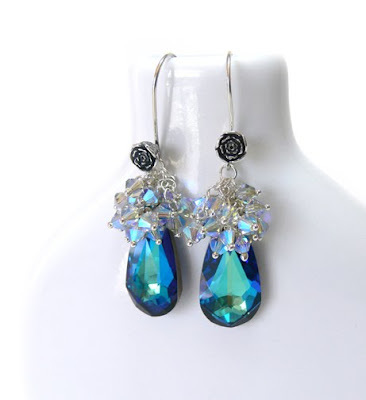 In this instance, I chose Swarovski crystal buttons and turned them into earrings. These also were not the easiest things to make, and it took several tries to figure out the right gauge of wire (22ga) and the right type of armature in the back of the button to make everything connect. With only two holes, I had to make one piece of wire hold all the chain AND make the loop that would hold the ear wire, all while not accidentally cracking the crystal. It takes some practice to get them to hold straight and not drop to one side or the other, but when they're right -- oh my. The result is amazing. 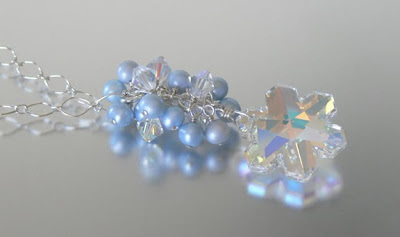 I hope you've enjoyed this review of some of the many Swarovski crystals that ArtBeads.com offers! 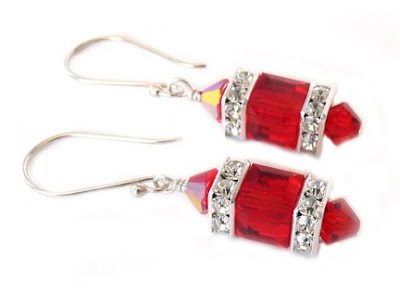 You can go directly to their huge selection of crystal by clicking http://www.artbeads.com/swarovski-crystal-beads.html . Lori Anderson makes jewelry when she's not writing or catching up on sleep. You can see her work at www.lorianderson.net. I absolutely love Blog Parties. 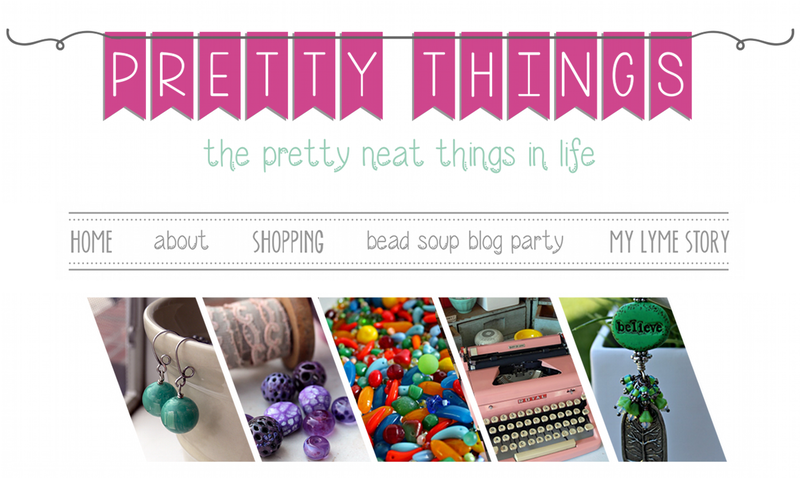 Most have a theme, and the idea is to have a "party" on your blog on a particular day. The hostess has a page that lists all the party-goers, and everyone hops from one blog to another, visiting and leaving comments and discovering people and places they never would have before. I now follow a number of blogs that I've found this way. 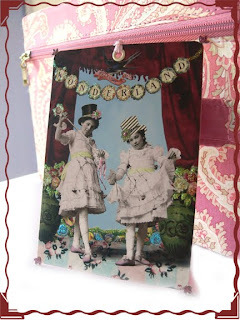 One of my favorite such parties was Vanessa Valencia's Mad Tea Party back in (eek) June. Yes, I know.... I'm late, I'm late, for a very important date! It's taken me this long to write about the after-effects of Drinking THIS ONE and Eating THAT ONE. But it's worth it, I swear. 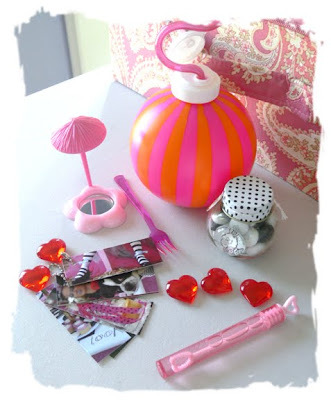 There were lots of fantastic parties to visit, but one of my absolute favorites was at the blog Minor Details. 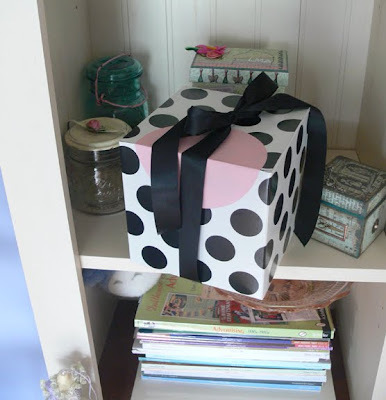 So I was ecstatic when one day a huge box arrived on my doorstep -- a box of party favors from her Mad Tea Party! Zack was all over that polka-dotted box. When I opened it and squealed in delight, he came running, so I let him pull out all the bits and bobs. Some never made it long enough to pose for the camera (like the bubblegum-flavored rock candy), but suffice it to say, there were some amazing, fun things. Zack claimed these. 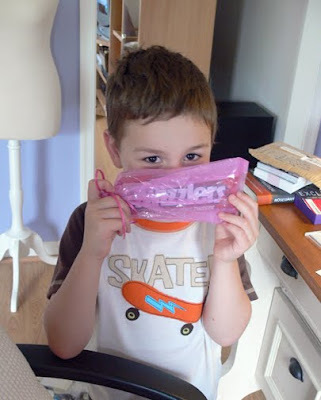 And to me, it's all about packaging, so that hot pink bag is MINE -- Zack can have the candy! 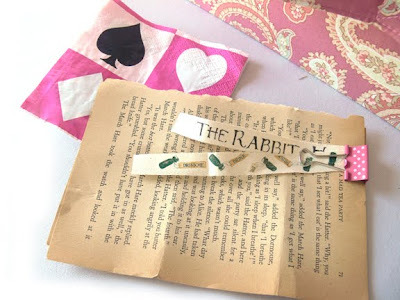 Pages from a vintage "Alice in Wonderland" book, and bits of ribbon with the Alice theme. I love vintage goodies and have them all OVER my office. In fact, I just added another huge shelf just to show off more of them. And this is just a small assortment of the fun things we found. In addition to the bubbles, M*M's that said "Eat Me" and "Drink Me", and a most superior sippy cup, there was the famous plate ring that I loved so much, paper umbrellas, tops, kaleidoscopes, a tiny ballerina, and all manner of trinkets that I went nuts over. The box, like the rabbit hole Alice fell into, seemed to have no bottom. Thanks so much to Minor Details for such a lovely party! 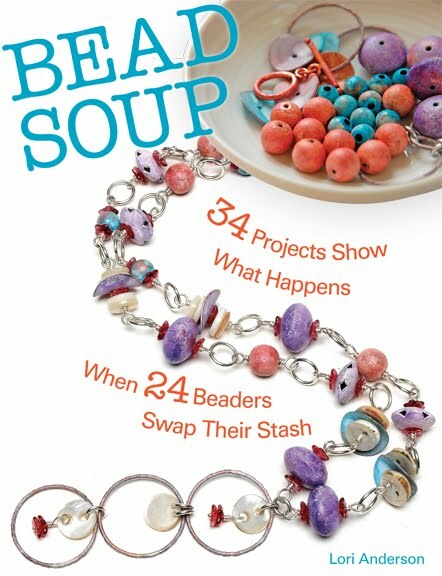 Thank you for the enormous response to the Bead a Day calendar contest! I was amazed at all the comments, Tweets, and Facebook entries that came through. There were so many, in fact, that I decided to have a second drawing. 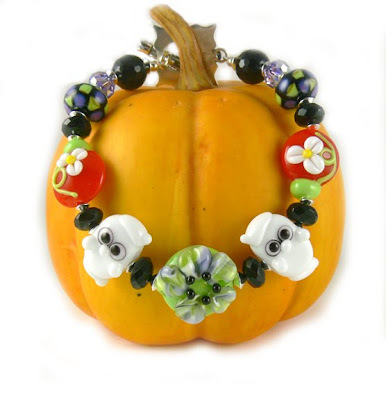 The runner-up will receive a special packet of beads which I hope will launch you into creative fun! 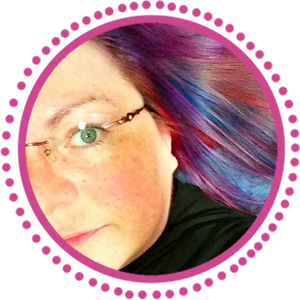 I hope you'll visit Valeen's and Sherry's blogs, and thank you for participating in the contest! My husband: "AGH! The internet is SO SLOW right now!" Zack (nonchalantly): "So buy a new one." I am so longing to go back to bed and immerse myself in "Dragonfly in Amber" because it just started to rain and there's nothing like clean sheets and rain and a fantastic book. Unless it's cake. Or pie. Mmm. Pie. Yesterday, when there was sun, I took some photos of jewelry that I made months ago (I'm telling you, I really did take the entire summer off!). I played around with not only natural sunlight but with various props. This shot was done with a stack of books that I bought sheerly for their beautiful covers and a lovely vintage cup. I thought the picture probably ended up too busy, but it certainly is fun and bright and cheerful, so I give you this, on my dreary, rainy day. Want them? Just click here to go to the Lori Anderson Designs web page! One of my friends just told me some tragic news -- a mom friend of hers was killed in a car crash. Her two children, aged 1 and 2, were with her but were unharmed. Unharmed in body, but they've lost their mother before they even got to know her. Things like this always give me pause. I look at my family and think, "what if". I thank my lucky stars every night already for the love my husband and child already give me, but horrible things like Emily's death make me say an extra prayer -- one for her and her family, and one for myself, that I never take for granted what I have. My friend has an Etsy shop and is donating 40% of her sales towards a $2,000 US treasury bond for the children. 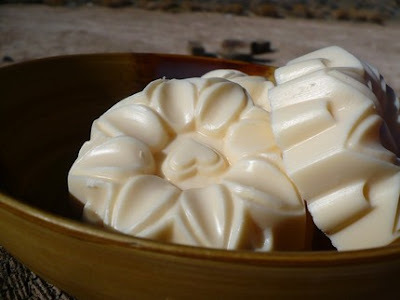 So if you are in the need of handmade soap, her shop is http://desertmaidenbath.etsy.com. And hug your family today! 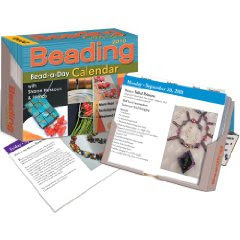 I have a tutorial in the 2010 Bead A Day Calendar this year and am going to be giving a calendar away! 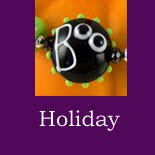 There are tons of tutorials in the calendar, and mine is for my "An Austrian Holiday" necklace (which is also featured in the new blog header that Vanessa Valencia created for me). 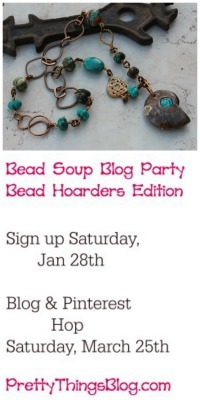 In addition to giving you the calendar, I'll send you some beady goodies to get your started! 1) You get a point for making a comment below. 2) You get a point for Twittering about the contest. 3) You get a point for Facebooking about the contest. 4) You get a point for blogging about the contest. If you Twitter, Facebook, or blog, be sure to note the links in your comment. The comments will be closed Saturday, September 12th, at midnight. Have fun!!!! 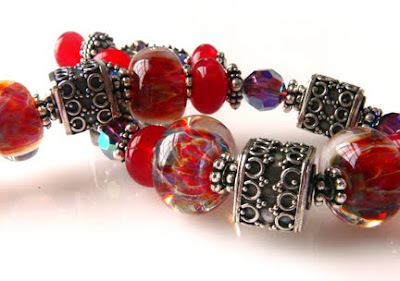 Today I'm sharing a little piece of eye candy that I just added to www.lorianderson.net -- a gorgeous piece called "More Than Ever", made with lampwork glass, crystal, and dyed jade. Like it? Click here and you can order it now!